The MPO / MTP Cassette Modules provide secure transition between MPO / MTP and LC or SC discrete connectors. 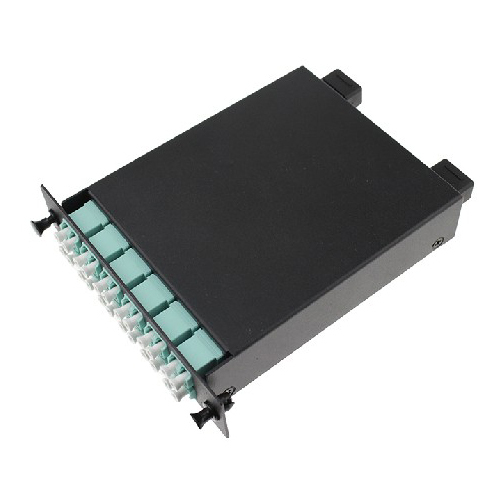 They provide a quick, reliably high performance and efficient way to deploy up to 24 LC or 12 SC fiber ports in a single module. The Modules can be mounted in 1U or 4U 19” multislot chassis. They are available in Multi-mode and Single-mode cable. High-density and small design, Easy and fast installation. Available in 12 / 24 / 48 fiber versions. Field connections with guaranteed quality and simplifies fiber routing. Modular system management, easy reconfiguration for moves, adds, and changes. Customized fiber polarity in the module. Telecommunications networks and Broadband / CATV networks.